[AUTO]:When this unit is placed on (RC), choose another of your , and that unit gets [Power]+2000 until end of turn. Ratings are based on a 1 to 5 scale. 1 being the worst. Today we have another card that has seen cloning over various clans with time - Starlight Unicorn. It never came to be outright replaced like Bors, but then again, it never was all that good in the first place! When placed on a rear-guard circle, Starlight Unicorn can grant 2000 power to any Royal Paladin for the turn. This gives you an opportunity to force an extra card from an opponent's hand on the offensive if used on a suitably strong column. In its favor, it's also a High Beast, so Akane can call it from the deck. After that turn, it sits on the field serving as nothing more than a mediocre 6K booster with no means of being recycled, unlike the Bermuda Triangle counterpart in Blazer Idols. 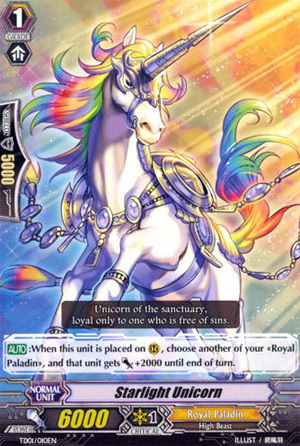 There's plenty of competition for Grade 1 space in any given Royal Paladin deck: Marron, Lien, Pongal, Iseult, Toypugal, Galahad in a dedicated deck, or even more recent additions like Kay. They're all strong cards with wide variety of applications, none of which Starlight Unicorn can truly boast. 2000 power can be a lot. Just ask any of the grade 3 clones that gain 2000 power when they attack, or any crossride who is a nice beefy 13000 on the defense thanks to a permanent 2000 power boost. Unfortunately for Starlight Unicorn, 2000 power just isn't enough. His ability, giving 2000 power for the rest of the turn to a fellow Royal Paladin when he enters play, is both too little and too situational to be useful. It requires pretty specific numbers on your board to boost to another actually important stage of power, and while you're waiting for such a setup you are forced to sit with the Unicorn in your hand, meaning there is a spot on your board without a booster when there could be one. Not that he's a very good booster, either - 6000 power doesn't do much behind anything but vanillas and other units that can at least swing for 10000 alone. Top that off with the fact that his effect doesn't even merit that meager boosting power, and you have a pretty useless card on your hands. Starlight Unicorn and its clones are not that amazing a cards. Sure they effectively become an 8k boost, but only for that turn. You are always going to be better off with another unit especially in Royal Paladin decks. In other clans that can return them to hand to be used again its ability would be a lot better. I'm really sorry about my computer keeps crashing for some reason whenever I try to save this, I wrote it at work in a scribble pad and emailed it to myself but yeah. I hope this is okay. Well everyone, here is the gift you asked for when you wished upon all those stars, Starlight Unicorn. power) there really is no room for a card like this in any sort of build. I honestly don't have much to stay about our pointy headed friend. This one trick pony is a lackluster unit, in a clan full of support who's effect has no major gain like something of that in a clan like Dimension Police. I really can't support the use of this card in any deck unless you're just starting out and cards are limited. Sure it makes okay filler until basically anything else comes along, but other then that, I'd stamp this with a "Do not use" and send this Unicorn on her way. Now to rate the Starlight Unicorn, I'll honestly have to give it a 1/5. I really can't see any use for using it, unless you have little to no other options. 4/5 for artwork. I like ponies?